Just now I was publishing my .NET 2.0 website. What a shock! Visual Studio 2005 shown published completed and successful. However, my target published folder was empty!! At command prompt type Aspnet_compiler -v /WebApplication1 -p "c:\CompiledSite " -errorstack -errorstack Specifies that the tool should include stack trace information if it fails to compile the application. For more see http://msdn2.microsoft.com/en-us/library/ms229863(VS.80).aspx If You see some thing like [HttpParseException]: Unexpected end of file looking for tag. Correct the error(s) and run again. Till the time you finish it with no error. Yeah! Finally I found one of my aspx file containing some invalid xhtml codes. You can always turn on the validation when you build your web projects. And you got your error and get it solved before you publish it. Visual Studio 2008 & .NET Framework 3.5 Released! According to Scott Guthrie indicated that source code for the .NET Framework 3.5 will be released in October shortly after the framework itself is available. Good news to be announced that Microsoft announced two Visual Studio 2008 licensing changes. One, solutions built with the Visual Studio 2008 SDK (Software Development Kit) will not be limited to Windows or other Microsoft platforms, as they had been limited in the past. Two, Premier-level VSIP partners can view Visual Studio 2008 source code for debugging purposes and see how their VS extensions are interacting with Visual Studio itself. Language Intergrated Query (LINQ) which embeds queries for entities, collections, datasets, objects and XML within .NET programming language. 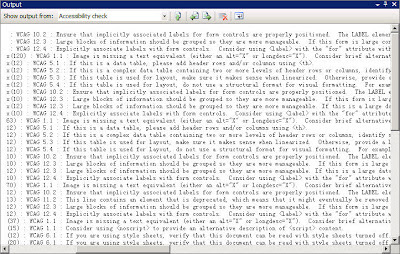 Besides, New integrated features are LINQ syntax checking and schema checking. ASP.NET AJAX and Visual Studio Tools for Office, which were previously available as downloadable add-ins to Visual Studio, are included with VS 2008. The .NET Framework 3.0 libraries have been updated, with a Windows Communication Foundation designer, WCF support for RSS and REST and better interaction between WCF and Windows Workflow Foundation among the improvements. Visual Studio Team System and Team Foundation server also received a refresh.These features include support for SharePoint 2007.New code analysis rules and check-in policies, better support for testing Ajax applications and continuous integration of builds. Visual Web Designer intergrated with CSS supports and split screen view. Windows Server 2008 and SQL Server 2008. MSDN subscribers can download Visual Studio and download the .NET Framework 3.5 today. BUT, Application on .NET framework 1.1 are able to run on vista though. 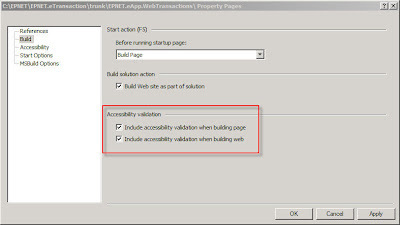 You might need front page extension in some cases to enable your .NET 1.1 web app. In case you need Front Page Extension on IIS 7.0 ( Vista ). click here. and applying web services model instead of traditional vb6 component services. On the other hand, still researching and play around with vs2008 orcas beta 2. What about you guys did ? Any better suggestion ? How to get this event ? 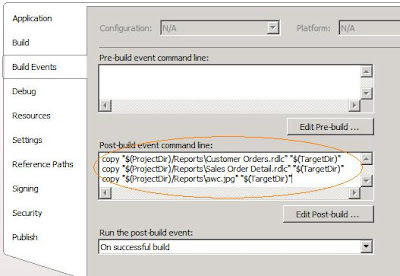 Right click Project property on Solution Explorer.